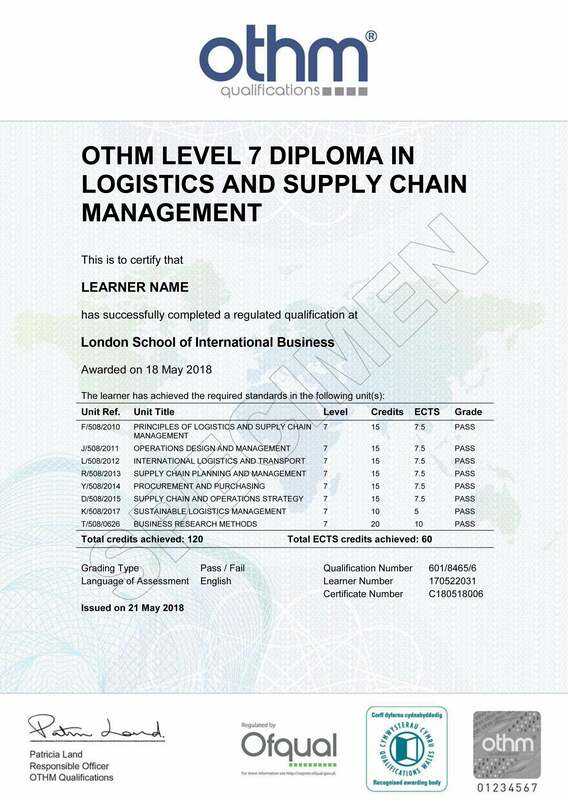 The objective of the OTHM Level 7 Diploma in Logistics and Supply Chain Management qualification is to broaden learners’ understanding of logistics and supply chain management and is designed for those who wish to prepare for a first professional role and future career in the field. It is also suitable for logistics and supply chain professionals in the early stages of their career looking to enhance their knowledge and skills and move to the next level professionally. Successful completion of this qualification will equip learners with the specialist knowledge and skills needed to further their career as a logistics and supply chain professional as well as the opportunity to embark on further study towards a relevant Master’s programme with advanced standing. The Level 7 Diploma in Logistics and Supply Chain Management consists of 8 mandatory units for a combined total of 120 credits. ● 5 year of work experience if non of the above.